The Bledsoe Achilles Boot saves time by eliminating casting series required to stretch the achilles tendon during rehab. Optional air ankle/heel pad allows for ability to adjust ankle pressure for increased comfort and provides pneumatic ankle support. 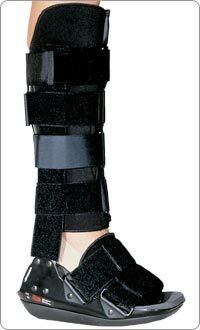 This device is indicated for immediate application following injury to or reconstruction of the achilles tendon. This device is contraindicated for unstable fractures and proximal tibial or fibular fractures. Shoe size (preferred) or leg measurement taken from knee joint line to medial malleolus.